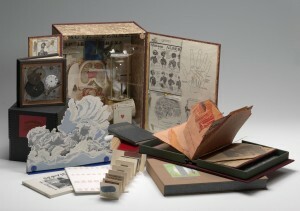 The Artists’ Books Collection includes hundreds of works of art in book form across numerous branches at the Smithsonian Libraries, spanning the 20th century through today, including works by artists such as Georges Adéagbo, Ida Applebroog, Julie Chen, Laura Davidson, Barbara Kruger, Sol LeWitt, Luan Nel, Yoko Ono, Ed Ruscha, and Claire Van Vliet. While some books in the collection are fairly common or are multiples, many are limited editions or unique and cannot be seen anywhere else but at the Smithsonian Libraries. The site serves as the portal to search or browse the entirety of the collection across the branches, to provide information about collection access, and to highlight book arts related happenings, projects and acquisitions at the Smithsonian Libraries. This search portal has been a collaborative effort to bring artists’ books to light at the Smithsonian’s Cooper Hewitt, National Design Library, the American Art Museum/National Portrait Gallery Library, the Hirshhorn Museum and Sculpture Garden Library, and the Warren M. Robbins Library at the National Museum of African Art, as well as the Dibner Library of the History of Science and Technology. The webpage is the culmination of several years of work on the part of staff and interns across the Smithsonian Libraries. Previous Post Books as Art?